Firstly, apologies for the lack of updates over the Spring and Summer – weather-wise, 2012 has been an extremely unpredictable year, and even after some almost considerable effort by a stalwart skeleton crew to persevere during a dismal Spring.. We saw no interesting visible migration from Cabot Tower (apart from a solitary hobby flying due north only a stone’s throw away) and made an executive decision to cancel the CTBSG Spring migration watches. We had anticipated that even though Autumn 2011 saw plenty of action (most notably the mass influx of winter thrushes in mid-october and “woodpigeon day” on the 6th November), Spring migration might be a different story, with birds flying north choosing different flight paths, which avoided flying directly over the city before reaching Brandon Hill and Cabot Tower – and regrettably, our predictions proved to be accurate. However.. I am pleased to report that the CTBSG will be meeting up again this month to continue to study the Autumn migration over Bristol, to contribute valuable data to the BTO and to compare results with last year and with the other major urban study taking place this Autumn in central London: T42BSG. After just as dismal a start to the year for the Tower 42 group in the shape of a complete shut-down (due to administrative problems and a change of ownership), I can report that David Lindo has managed to work his magic with the new owners of T42, and they have kindly agreed to give him the go-ahead to recommence proceedings – so it looks like it is going be an exciting Autumn for urban visible migration study in the UK. 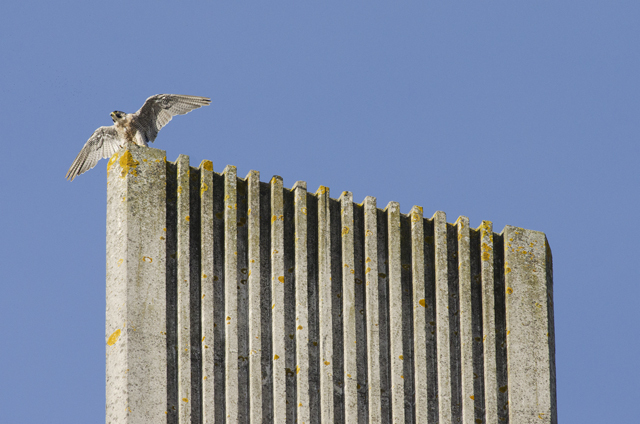 This Autumn has already seen some interesting goings on in Bristol, with a few unusual signs of migration over the city coming from the remains of the city-centre peregrines, which I have been closely monitoring. 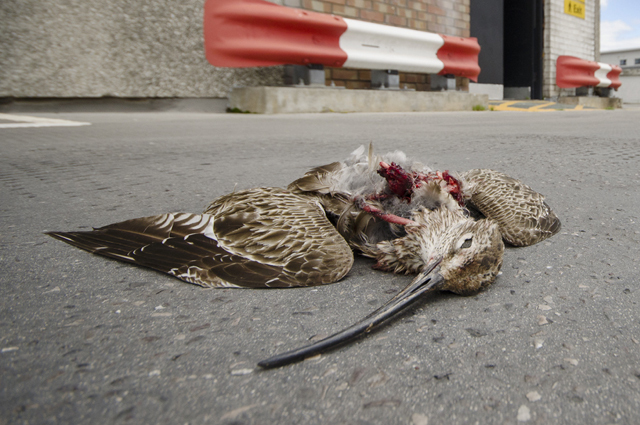 After unexpectedly finding a common tern carcass floating in the harbour earlier this Summer – right underneath the peregrines’ perch in the heart of the city, I was even more surprised just recently to find the remains of a whimbrel on the roof of a city-centre car park.. 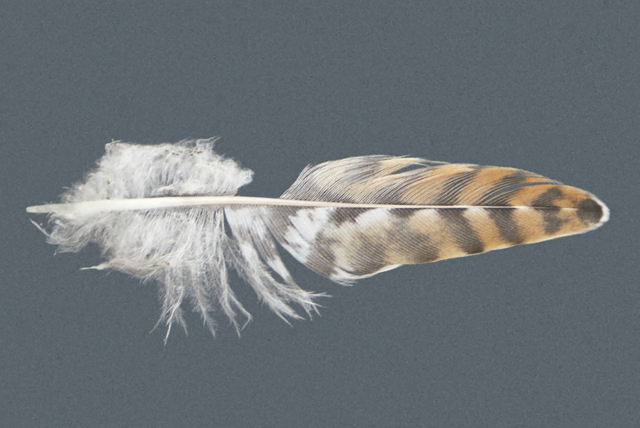 The tall building overlooking this location was used as a perch by the town peregrines to feed the solitary juvenile in the few weeks after it fledged, and they had obviously been busy picking off passing migrants, as in the same week that the whimbrel was discovered, I also found this feather from a juvenile cuckoo (identified by Ed D) – an equally unusual urban vagrant..
At Brandon Hill, the most notable sighting this Autumn has been a nuthatch feeding in the trees and shrubs around Cabot Tower at around the same time as the peak of the phylloscopus warbler passage. Nuthatches are common in some areas of Bristol, but are typically sedentary (not a single British-ringed nuthatch has ever been recovered outside of the UK and similarly, no foreign-ringed nuthatch has yet been recovered here) and this was my first ever record at the Hill – WWT Slimbridge also with a recent sighting and only their 6th record. From the top of the tower, the signs of Autumn are becoming increasingly regular. 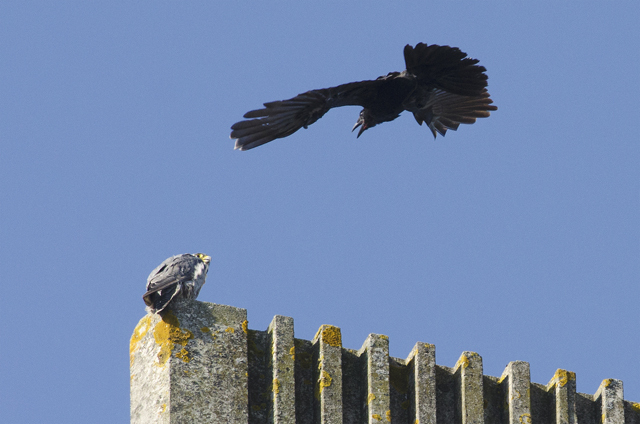 The adult peregrines that nested in the Avon Gorge are now frequenting their off-season perches on Christchurch, Clifton Catholic Cathedral, the Wills Memorial Tower and the old tobacco houses by Cumberland Basin. And not escaping the attention of the local corvids!.. Visible migration is starting to pick-up with the odd meadow pipit and trickles of white wagtails already passing over south and west in the first hour after sunrise. In the coming weeks, there should be a sharp increase in numbers of both of these species and hopefully it won’t be long before the finches and thrushes start to join them. If you are interested in joining the group, please comment below (email address not publicly displayed) or contact us here. For those of you already on the mailing list, please register your interest and I will confirm and send out further details during the week commencing 24/09/12. Hope to see you at the top of the tower! 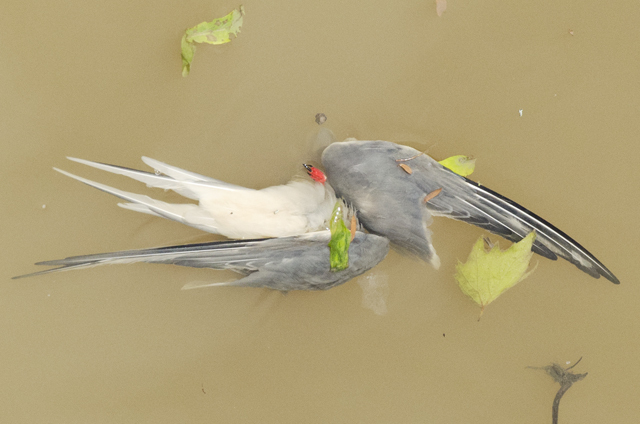 This entry was posted in Migration, News, Planned watch dates by birdsoverbristol. Bookmark the permalink. have added your email to the mailing list and will be in touch to confirm with dates / times around the 26th of September. After that we will meet weekly, most likely until mid November. Cabot Tower Bird Study Group meeting tomorrow..